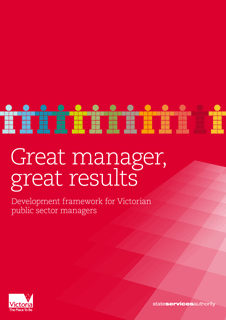 Managing a Dispersed Team is a guide is for public sector managers who are responsible for direct reports who work in a different location from them. a change to the work arrangements for an individual to a dispersed team (for example, an arrangement for them to work from home on a regular basis). The guide highlights the issues managers need to think about when managing a dispersed team. It also provides some practical tips on how to apply good people management techniques when staff are physically distant. Please note: Due to the use of images and graphics, this document is being provided in its original PDF format, as published by the former State Services Authority in July 2013. If you have difficulties downloading or require an accessible version, please contact VPSC. One page summary of the topics covered, acts as a checklist or reminder sheet.